NJDEP - New Jersey Geological and Water Survey - Bedrock Geologic Map of New Jersey, 2014, Scale 1:250,000. 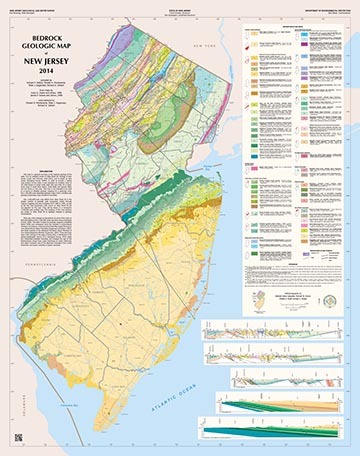 Bedrock Geologic Map of New Jersey, 2014, compiled by Richard Dalton, Donald Monteverde, Peter Sugarman and Richard Volkert, is an update of a map first published just over 100 years ago, referred to as Atlas Sheet 40, in March, 1914. The earlier Geologic Map of New Jersey by J. Volney Lewis and Henry B. Kummel has been in demand but out-of-print for many years. The original map was reprinted numerous times by State Geologists Henry B. Kümmel in 1931, Meredith E. Johnson in 1950, and finally by Kemble Widmer in the early 1960’s. Supplies of this reprinting were exhausted in 1988. The new 1:250,000 – scale map was compiled from the 1:100,000 - scale digital data from the cooperative geologic mapping program between the New Jersey Geological and Water Survey and the USGS, which began in 1984 and was completed with the publications of the Bedrock Geologic Map of Northern New Jersey (1996) and Bedrock Geologic Map of Central and Southern New Jersey (1998). Additional background information about the new map is detailed in our Newsletter Summer-Fall 2014. Use the Order Form to purchase the map for $20, including free shipping.